So far I’m truly enjoying it. It’s a pleasure to read and it’s also helping remind me of one of my other goals: gratitude. To be honest these days I rarely even think about being vegan. I’ve done it for so long and it’s become so natural that sometimes days go by without me noticing. And from that forgetting comes taking that part of me for granted. I haven’t thought about the positives or negatives of being vegan in a long time. And because of this I haven’t felt as excited about being vegan lately. 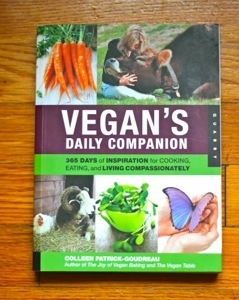 This book has been getting me excited about being vegan again. It’s not full of do-gooder save-the-world vegan propaganda, although there’s no denying it’s propaganda of a sort. 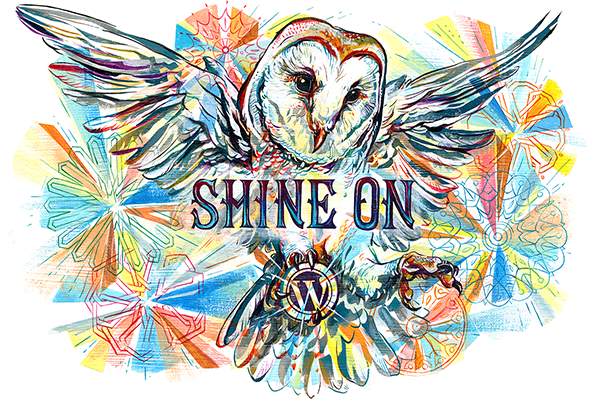 It’s written like a mantra, reminding the reader of ways to live as a joyful vegan. Its like a Chicken Soup for the Vegan Soul! So far I’ve learned – or been reminded – through reading and reflecting that my ultimate goal as a vegan is one means to and end: unfettered compassion. I personally cannot allow my personal convenience to outweigh animal violence, and being vegan is one easy way to bring compassion into my life. Not to mention it encourages me to get creative with ingredients and cooking techniques, and I would say that I eat more diverse foods now than before I became vegan. Ahimsa – the idea of causing no harm, is a phrase I am drawn to while reading this book. 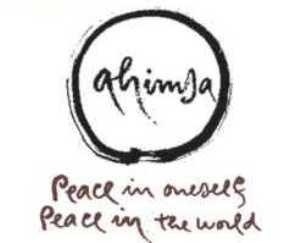 I’d like to meditate on this and learn more about ahimsa and nonviolence this year. The Companion is organized like a day minder, with a passage for each day of the week. Monday is dedicated to “the love of food” and Friday is “stories of hope, rescue, and transformation.” Saturday and Sunday are for “healthful recipes”! Promise to review more fully when finished! You are inspiring me to get my own book of daily reminders. Barnes & Nobles here I come! I’ll send you this one once I’m done. It won’t take me long, I’m not actually following the days, I just read it when I can and it’s full of little inspirational stories or recipes! You’d even like it, I just read a summary of a terrifying short story that Roald Dahl (The BFG) wrote for adults. It’s call Pig and it’s about a boy that’s raised as a “strict vegetarian” who tries pork for the first time as an adult and love it! Now I want to read that story! Ahimsa is a very worthy goal by a person with a great heart.